There are two basic strategies for mitigating flood damages. One is to raise the level at which structures are built. The second is to lower the level of the flood waters. While flood mitigation policy should utilize both, the latter is vastly more efficient and effective. The first, and most obvious reason that lowering flood levels should be preferred, is that raising new structures does nothing to protect the billions upon billions of existing buildings and infrastructure which are currently subject to flood damage. In fact, depending on how new structures are elevated, they can make flooding worse for existing structures. The second problem with relying on attempting to raise structures out of potential flooding is that no one really knows how much you need to raise in any particular area. That is because we really have very limited ability to predict where it is likely to flood and even less ability to predict how high the water might get. 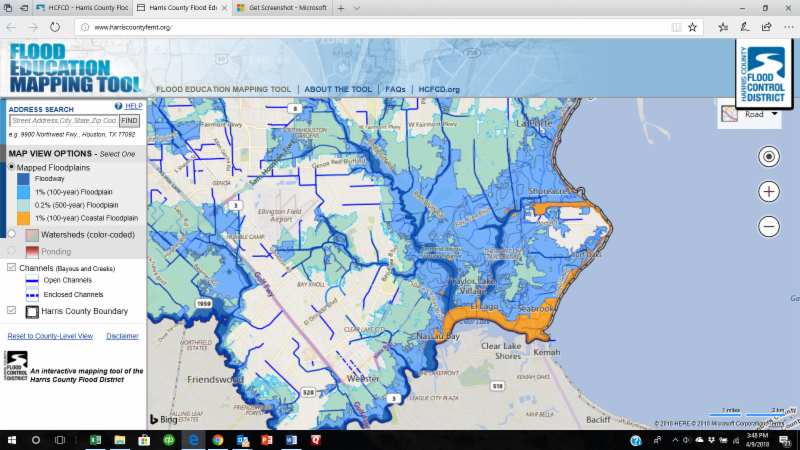 FEMA publishes the so-called 100-year and 500-year flood plain maps which supposedly show areas that have a 1% and .2% likelihood of flooding in any given year. But as we have seen, those maps are, at best, educated guesses. In Harvey many areas outside even the 500-year flood plain flooded, but many within that boundary did not. 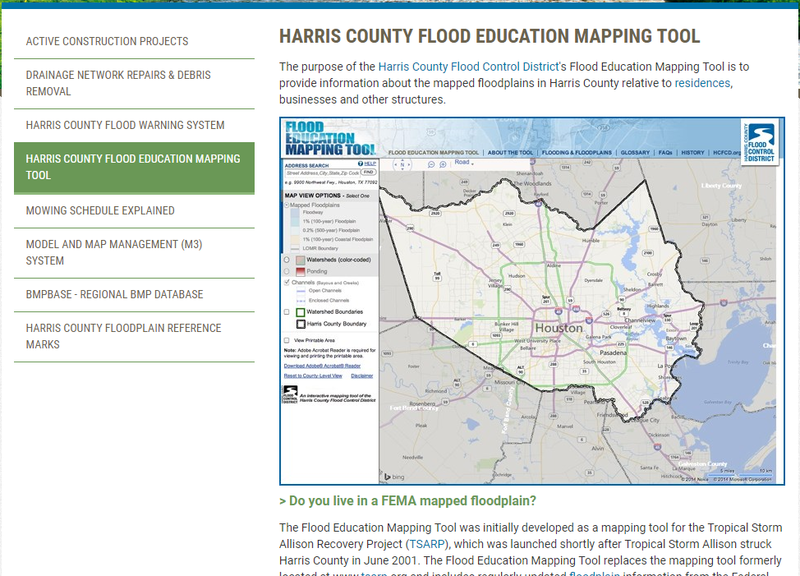 BTW, if you would like to know if your property is in either of flood plains, you use this handy Harris Flood Control website to find out. The flood plains are only rough estimations because every rain event is unique and even small variations in the amount of rain, how fast the rain is falling, the state of repair or disrepair of flood infrastructure and how soaked the soil was before the rain, can all have a dramatic effect on which areas flood. And occasionally, there are random factors, like releasing the flood waters from reservoirs, that make the flood map predictions completely useless. Also, the flood maps only cover the riverine system. There are many areas subject flooding outside the riverine, principally due to inadequate flood control infrastructure. So, the truth is we will never really know exactly which parcels need to build their structures higher or by how much. On the other hand, we know without a doubt that lowering flood levels will absolutely result in less flood damage. We can reduce flood levels by improving conveyance and enlarging detention areas. Improved conveyance – things like straightening bayous, enlarging drainage pipes and removing impediments to drainage (like low bridges) – hustles the flood water to Galveston Bay faster, thus not allowing it to “stack up.” Additional detention provides areas to store the flood waters, somewhere other than your living room, while the drainage system catches up with a heavy rain. Both strategies are very effective; but both are also expensive. But then so is raising new improvements. And that is what irks me about what City Council did last week. By dramatically raising the minimum building level, the City effectively imposed a new tax on all new construction. Of course, seven years ago we agreed to an annual $100 million new tax, the drainage fee, which we were promised would be used to solve some of these problems. Instead it has been siphoned off, mostly to balance the City’s budget. Only a small fraction of the money has been spent on flood control. So, the City is effectively taxing its residents twice. The second time, in large measure, is because it looted the first tax. Please don’t misunderstand me. I think City Council should have raised the minimum building height in some areas. But the more I study the area that is now subject to regulation, not to mentioned the new areas that will be regulated after the new flood maps are issued, the more I am coming to the conclusion that the new ordinance was a colossal overreach. It will nothing to prevent flooding in the short term, and only have a minimal impact in the long term. And it appears that it will result in enormous costs and many unintended consequences. More on that subject later.